That’s the front of tomorrow’s Sun. Needless to say, it’s a Murdoch paper. What, you may wonder, is the evidence they have that links Norway’s massacres with Islamic extremism? The main clue would probably be that Al Qaeda sells more papers. The little actual evidence so far seems to point to a home-grown rather than pro-Islamic terrorist threat. Not that it couldn’t be both of course, but several Norwegian news sources – TV2 for example – has stated that the suspect arrested had connections with Norway’s far right. 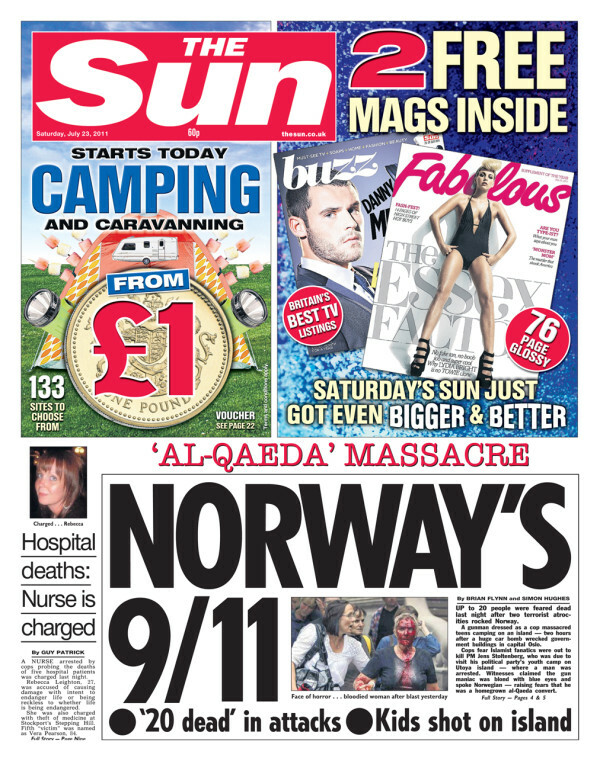 VG, the major Norwegian tabloid that was caught in the blast, says the suspect described himself as ‘nationalist’. It appears that he was an outspoken opponent of immigration and of Muslims. So it may well turn out that this was actually an act of anti-Islamic terrorism. The irony would then be almost too much to bear. But you wonder, does understanding the political motivation behind this actually matter? The most salient feature of an ideology that thinks it’s all right to kill people at random is that it thinks it’s all right to kill people at random. There isn’t much ground for further discussion. We may as well say that the attack in Oslo was carried out by The Evil Ones and leave it at that.